Noah, Covenant, and “Cursed be Canaan” | "A Song Every Day"
Posted on October 31, 2016 by vspatz	in Breishit, Ethics, National biography, racism and tagged 13th, Ava DuVernay, David Goldenberg, Noah, Stephen R Haynes. 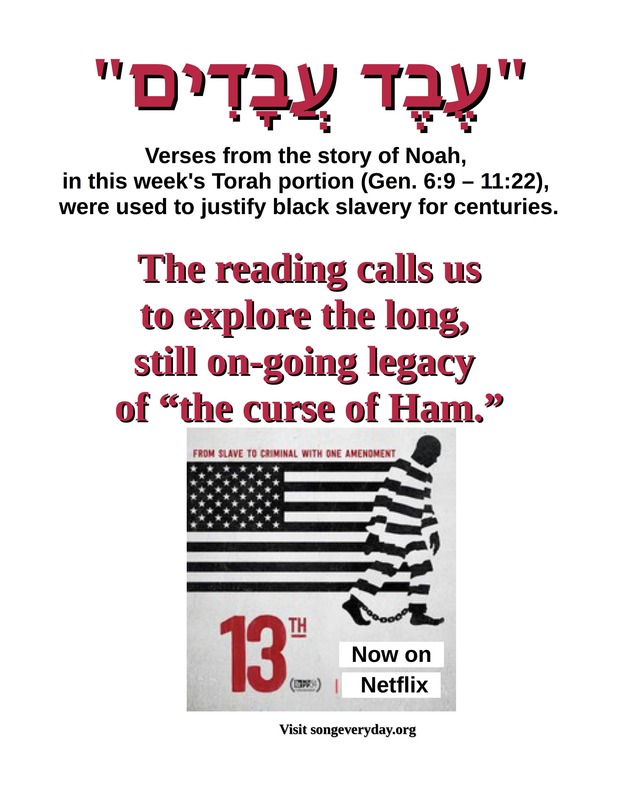 The “curse of Ham” — with related ideas about slavery and race, unsupported by the the text itself — emerged over the centuries from the biblical story of Noah. Regardless of our particular faith community’s approach to this curse concept, there is no denying the damage done by what one author calls “the single greatest justification for Black slavery for more than a thousand years” (Goldenberg, The Curse of Ham). Racism and oppression have become inextricably linked with the Noah story. This moment in U.S. history seems to demand that we acknowledge the damaging legacy of our collective textual heritage. Some readers might find it worthwhile to examine the complex religious career of the “Cursed be Canaan” text, its development in Abrahamic teaching and its role in Western history and culture. A few references are shared here toward that purpose. But we need not pursue an academic route in order to answer the ethical call of this week’s Torah portion. Immediately after the Flood, God’s introduces a covenant, symbolized by the rainbow (Gen. 9:17): God promises never again to destroy everything by flood, and humans are expected to obey basic laws. The prohibition against shedding human blood and some of the other “Noahide Laws” are specified in this week’s portion; others, according to Jewish tradition, are found in or derived from other passages in Genesis. Upon realizing “what Ham had done to him,” Noah responded: “Cursed is Canaan; a slave of slaves shall he be to his brothers.” Noah goes on to specify that Canaan, son of Ham, will be a slave to his uncles, Shem and Japheth (Genesis 9:25-27). Only Canaan is mentioned, but the curse is often understood to apply to generations of descendants of all four of Ham’s children. And, while there is no biblical reference to skin color at all, the curse of slavery became associated with black skin. …it is not clear when to date the fateful conjunction of slavery and race in the Western readings of Noah’s prophecy….the application of the curse to racial slavery was the product of centuries of development in ethnic and racial stereotyping, biblical interpretation, and the history of servitude. Nevertheless, by the early colonial period, a racialized version of Noah’s curse had arrived in America. DuVarney’s 13th looks at slavery — outlawed by the 13th Amendment, except as a punishment for crime whereof the party shall have been duly convicted — and its re-incarnation through mass incarceration. 13th does not explore biblical text or religious teaching. It looks at the U.S. criminal justice system today and its relation to the broader history of racism, oppression and subjugation of black people. establishment of a courts and a system of law. What is the rainbow saying with regard to our record on murder, stealing, and courts? וַיִּיקֶץ נֹחַ, מִיֵּינוֹ; וַיֵּדַע, אֵת אֲשֶׁר-עָשָׂה לוֹ בְּנוֹ הַקָּטָן. וַיֹּאמֶר, אָרוּר כְּנָעַן: עֶבֶד עֲבָדִים, יִהְיֶה לְאֶחָיו. Various explanations have been suggested for why Canaan was cursed rather than Ham. Genesis Rabbah, for example, says that Noah couldn’t curse Ham, because God had already blessed him (Gen 9:1). Another possibility put forth was that Canaan was really the instigator. While the text speaks of individuals and not whole communities, many commentators over the centuries focused on moral factors which they believed might result in one people being subjugated to another. 2) Race and Slavery in early Judaism, Christianity, and Islam. David M. Goldenberg. Princeton, NJ: Princeton University Press, 2003. [Goldenberg] concludes that in biblical and post-biblical Judaism there are no anti-black or racist sentiments, a finding that some scholars dispute. He also contends that the notion of black inferiority developed later, as blacks were enslaved across cultures. His findings, he said, dovetail with those of other scholars who have not found anti-black sentiment in ancient Greece, Rome or Arabia. 3) Stephen R. Haynes. Noah’s Curse: The Biblical Justification of American Slavery. Oxford and NY: Oxford University Press, 2002. “13th strikes at the heart of America’s tangled racial history, offering observations as incendiary as they are calmly controlled,” writes Rotten Tomatoes, where the film gets a 98% positive rating from critics and a 94% positive audience score. “A damning but cogent argument for wholesale reconsideration of the so-called prison industrial complex,” is how the Chicago Tribune characterizes 13th. See also The Guardian, Black Youth Project’s review, with more at DuVernay’s website. The National Review‘s response is also fascinating in its way. The New York Times calls it “powerful, infuriating and at times overwhelming.” Many people, this blogger included, report needing to watch the movie in installments. In addition to some local screenings, 13th streams on Netflix. Sign up for a free month, if you don’t already subscribe or have a friend who does.